The following story first appeared 100 years ago, on March 29, 1916, in The Sun Dial column of the New York Evening Sun. 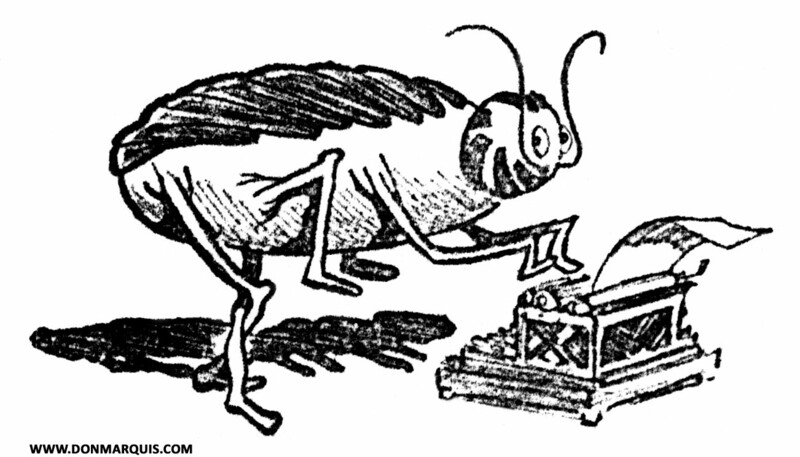 It was written by Don Marquis, the newspaper’s star columnist, and it introduced a fantastic fictional character: Archy the cockroach. Archy was unlike anything that had been seen in print before. Sure, literature was already full of anthropomorphic animals — from the characters in Aesop’s fables to Br’er Rabbit. There was even a talking insect: the Woggle Bug in L. Frank Baum’s Land of Oz. But Archy was new and different. There were no illusions of grandeur for a lowly cockroach, and his stories had the immediacy of a daily newspaper deadline. More than anything that had come before, he was a product of his times. Reincarnation was a new topic in the early decades of the last century, and so was free-verse poetry, and Archy was the reincarnation of a free-verse poet. Marquis, as Archy, used wry humor to comment on the most talked-about topics of the day: on flappers and bold women, on Prohibition and World War One peace negotiations, on new invention such as the radio and on the latest exhibits at the Metropolitan Museum of Art. It was topical and it was current, and it survives to this day, still fresh and on-target, still remarkably fun. And this is how it began. The text below is slightly different from what you will read in the opening pages of “archy and mehitabel,” collected and published in 1927 by Doubleday Page & Co. There are a few extra sentences in this original version, and Mehitabel the cat wasn’t mentioned by name yet – that would come a few weeks later. Enjoy. Dobbs Ferry possesses a rat which slips out of his lair at night and runs a typewriting machine in a garage. Unfortunately, he has always been interrupted by the watchman before he could produce a complete story. It was at first thought that the power which made the typewriter run was a ghost, instead of a rat. It seems likely to us that it was both a ghost and a rat. Mme. Blavatsky’s ego went into a white horse after she passed over, and someone’s personality has undoubtedly gone into this rat. It is an era of belief in communications from the spirit land – there is Patience Worth, and there is the author of the Letters of a Living Dead Man, and there are many other prominent and well-thought-of ghosts in touch with the physical world today – and all the other ghosts are becoming encouraged by the current attitude of credulity and are trying to get into the game, too. We recommend the Dobbs Ferry rat to the Psychical Research Society. We do not pretend to know anything about the Dobbs Ferry rat at first hand. But since this matter had been reported in the public prints and seriously received we are no longer afraid of being ridiculed, and we do not mind making a statement of something that happened to our own typewriter only a couple of weeks ago. We came into our room earlier than usual in the morning, and discovered a gigantic cockroach jumping about upon the keys. He did not see us, and we watched him. He would climb painfully upon the framework of the machine and cast himself with all his force upon a key, head downward, and his weight and the impact of the blow were just sufficient to operate the machine, one slow letter after another. He could not work the capital letters, and he had a great deal of difficulty operating the mechanism that shifts the paper so that a fresh line may be started. We never saw a cockroach work so hard or perspire so freely in all our lives before. After about an hour of this frightfully difficult literary labor he fell to the floor exhausted, and we saw him creep feebly into a nest of the poems which are always there in profusion.